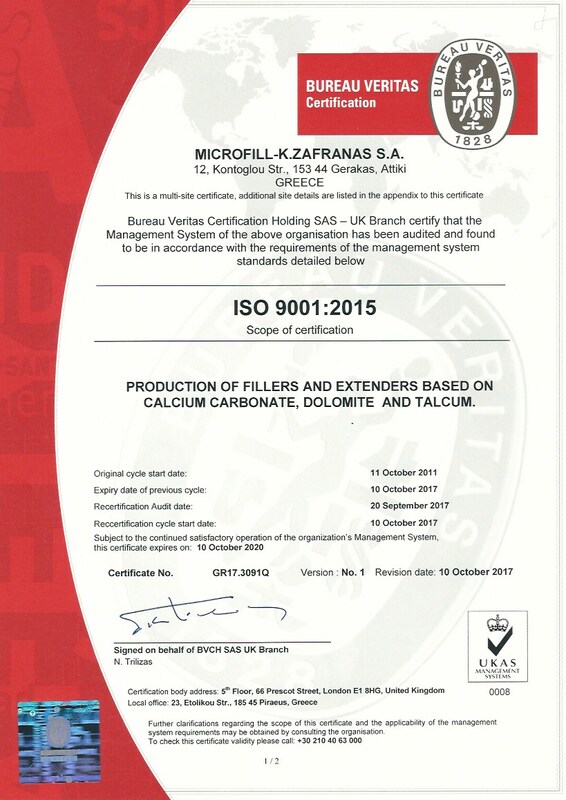 Microfill K. Zafranas SA's quality assurance management system operates based on the quality requirements set by the ISO 9001:2008. Our advanced technology and purpose-made machinery guarantee that we produce the highest quality fillers. Our production is controlled 24 hours per day so that problems and non-conformities are traced and mended before they occur. Our laboratory facilities are the key to our high quality standards. All production is checked by our quality control staff in order for us to ensure that each product complies with the tight specifications that we have set. In this way, we are able to issue, upon request, a certificate of analysis for any delivery we make. The measurements are taken by widely recognized instruments and all data are kept in computer records. Our experienced and well trained sales representatives work closely together with the production personnel in order to make sure that all customers receive only the best in terms of quality and service. From the moment an order has been received at our head office all details are promptly processed by order entry staff. Invoices and the necessary paperwork are prepared electronically so as to provide customers with accurate documents for custom clearance or accounting entries. Deliveries or shipments are made within the agreed period of time from the order confirmation.